For those more inclined to be in the Bubble 2.0 camp, rather than its more charitable Web 2.0 counterpart, here's some additional fuel for your scepticism. This blog is apparently worthless. This is an interesting concept, harnessing a recent transaction to use as a comparable valuation benchmark, but before Wall St. M&A teams rush out and start using it, a word of warning: it doesn't work very well, presumably due to the source data, rather than the execution of the tool itself. My good cyberbuddy Om Malik's blog is worth $1.15m, and worth every damned penny, while Martin Geddes' amazing efforts are worth a paltry $71k, and my uber-cyber-freund Richard Stastny's blog is worth only a scandalous $27k. What I find particularly amusing is that my blog is number 7 on Om Malik's "must read" list, yet it is invisible, i.e., there is no value attributed to association with, or referrals from, trusted parties. Meanwhile, I have 252 subscribers in Bloglines, a growing number of referrals coming from MyYahoo!, GoogleLens, NewsGator, and other sources, as well as lots of search-related hits. My crude estimate is somewhere in the neighborhood of 1,000 unique daily readers. I'm not in the habit of blowing my own horn, except for internally near bonus time (unfortunately management are somewhat hard-of-hearing), but this level of readership clearly can't have zero value. It would seem that the blogosphere, in striving to find ways to track and quantify itself, is (for now) falling prey to the same "islands of connectivity" fallacy as have the major IM and VoIP players: if we don't see it, it isn't there. Perhaps some day my true value may be realized and someone will pay me not to blog! As I'm now a paper millionaire, this blog is officially for sale, and I am going home early tonight to tell the family that Christmas isn't cancelled afterall. This market is going crazy. I have seen so many M&A headlines today, not only in telecom, that my head is spinning. Just now we got word that Telenor, with the ink barely dry on the TAC deal in Thailand, is acquiring Vodafone Sweden, which rockets it into third place in Sweden with a good franchise (15% subscriber share, but 23% revenue share). This on the same day that TeliaSonera's purchase of Chess/Sense got regulatory clearance. It's almost like M&A strategy is being driven by the press departments! Sure wish I had been able to attend this very timely workshop with the FTTH Council Europe last week. A high-fiber uber-value reader was kind enough to sling over the slides from Caisse des Dépôts & Consignations in France, which interestingly, show that currently there are apparently 25 local authority-backed fiber project public tenders ongoing, and a total of 34 feasibility studies started in 2005. A Nordic mega-value reader calls my attention to Lyse Tele's first international expansion moves - like the Danish market needed more pain. In response to the France Telecom/Amena deal over the summer, a friend in the industry recently remarked, "If you've got to make money by Friday, by all means buy a GSM network, but beyond that, forget it." I have long argued that the industry has too much cash and too little imagination, or rather, too little conviction in its attempts at transformation. When in doubt, buy more network. Friday gave us one good example (does anyone else remember that Vodafone just sold out of its previous Indian investment, RPG Cellular, last financial year? - A mega-value reader points me to this post, which gives a bit of history and also some interesting scenarios for Vodafone in Asia), and today we have a real cracker. A formerly very focused player puts its credit rating at risk to make yet another acquisition way out of footprint, and at nearly 9x forecast EBITDA and a 20% premium to the 52-week high. Cynics like me would say bring back Juan Villalonga (well, maybe not the man, but perhaps at least elements of his vision), and build a diversification strategy on core strengths in Latin America. Struggling today with two sets of results, Telenor and France Telecom, two dramatically different stories, as demonstrated by their respective share price performance today. Just a couple of interesting observations. Telenor CEO Baksaas said this morning that VoIP's impact is becoming more pronounced, and Michel Combe just remarked on the FT conference call was that the IP transition is moving more quickly than the company had anticipated, particularly in the business market. One other interesting tidbit is that Telenor now has 21k naked DSL customers on its wholesale lines (that's 21.6%), 56k naked DSL subs in its retail residential base (that's 14.4%). Add them together and you get 15.9% of Telenor's own residential DSL customers without a PSTN subscription. There are also 209k unbundled lines (28% of all DSL plant in the country). More later, if I survive. UPDATE: The France Telecom call was a bit of a bloodbath. I have an UNDERPERFORM rating on the company, but there were a lot of analysts on the wrong side of a BUY rating on the stock on the day when the company cut its full year revenue outlook and the share price took a 6% dive - and they aren't happy. One analyst from a BIG firm pulled no punches in pressing management on how it could have gone to the capital markets in late September to fund the Amena deal when its publicly-stated guidance was about to go out the window. Irritation levels were high, but management kept digging - one quizzical statement was that, while the company was publicly stating 3 - 5% pro forma revenue growth as guidance, internal forecasts were closer to the 3% end of the spectrum - as if this is some sort of justification which people will simply accept. When it comes down to the actual numbers, we're talking a few hundred million euro in Q4, which is a lot of money to me, but relatively trivial for a company with EUR48bn in turnover. From where I sit, the 6% decline in the share price was down to communication and perceived credibility. The worrisome question is whether the company has poor internal reporting systems, or whether visibility in its markets is so poor that they genuinely didn't see it coming. Neither is a good message to be sending out in a sector which performs as dreadfully as EuroTelco has this year. Let the games begin. Following Sky's cluster bomb of last week (I can only imagine how long were the faces at BT Centre), BT has turned on the public relations taps to spout its views on next generation TV. Everthing is as we have long expected - Philips box with hard drive and DTT tuner, subscription-free on-demand programming, launch in H2 2006. All fine and totally acceptable, except that by H2 2006 SkyNet (not to be confused with Skynet) will be in over 350 exchanges in the UK, within striking distance of a quarter of all homes, with a lot more TV. Neither will NTL/Telewest roll over and die in the intervening year. 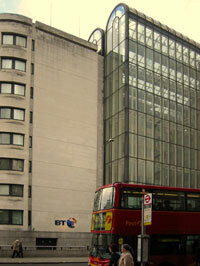 Rather than too little, BT's offering looks like just about enough, but maybe too late. 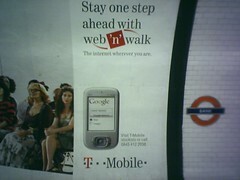 Lots and lots of T-Mobile web'n'walk marketing in prominent places on the London underground. The Google home page mock-up shown on the handset is very no-nonsense indeed. This takes me back to a time in early cellular history, when a subscriber in the UK could be asked, "What kind of phone do you have?" and would very often answer, "Vodafone," rather than, "Nokia." Few would make that mistake these days - confusing the device with the network. (Incidentally, notice that T-Mobile ensured its logo is larger than that of Google on the ad.) Now, on to content aggregation. Who's my mobile content aggregator? 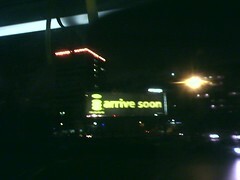 Current answer: Orange World (yuck). Future answer: Me and a bunch of pidgeons. Any bets on when we see GTalk for mobile? As usual, the two Swedes started off the quarter's reporting, making life miserable for anyone covering the Nordic markets. TeliaSonera's numbers (no, this is not an ad for Benetton) blew the top out of consensus expectations, and once more demonstrated that the CIS mobile markets are on fire (TeliaSonera's Kazakhstan subscribers grew 27% sequentially, and Tele2's Russian regional cellcos grew by more than 25% sequentially). Back home, however, not all is well. Sequential line loss for TeliaSonera's PSTN business on an annualized basis (in other words, if we take the loss for the quarter compared to the previous quarter, and assume it continues for a year), was 16.2%, an improvement over the previous two quarters, but that's still a huge number. Perhaps more interesting was the fact that Tele2's wholesale line rental customer base is now 480k, equivalent to 9% of TeliaSonera's line base - after only a little more than three quarters of marketing. Euphemism of the day - page 7 of the TeliaSonera slide pack - "1,325 of about 3,000 employees in transition." I was looking at my screen earlier and noticing that eBay was down an awfully long way, and I wondered why. The market seems to be worried about the Google payment solution, but I guess this won't help either. Three highly critical vulnerabilities, one of which is a revival of this old nugget, and would seem to be some negative publicity for "pay-per-call ROI". The second seems to be negative for the online presence angle, and the third, most worryingly, relates to an error in "the handling of certain unspecified Skype client network traffic," which can allow exploitation to shut down the client. UPDATE: It's not just Secunia which is concerned. The French Ministry for Higher Education and Research has banned Skype in all universities and research facilities. Mon dieu! This is a genuine screen grab from my Skype client, showing Ebay_Inc online. Some people have much too much time on their hands! Seriously though, this sort of thing could be seriously irritating to eBay powersellers if it expands to their identities as well. Very naughty. Here's a screen grab of the eBay user ID I referred to. Seems to be in the UK. I have sent a request for authorization. Following on from my earlier post I did a search for Skype_Technologies_SA, and there it was. 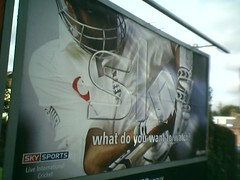 Sky seems to have taken over every square inch of billboard space in London. This is what the DSL crowd will have to contend with in a few months' time. Quite some time ago I wrote about companies using Skype, and in using Skype myself I have occasionally come across both other interesting (and apparently legitimate) company affiliations as well as users claiming to be various celebrities. I always assumed, however, that Skype had locked down most corporate names for future use, or at least to prevent people squatting. I assumed this would be even more important to Skype now that it is presumably drafting its B2B/B2C/C2B strategies for integration within eBay. "Ebay may have paid $4.1bn for Skype but I got 'Skype_Technologies_SA' for free. So pleased was I with this triumph that I also picked up 'Ebay_Inc'!" After more leaks than a Swiss submarine, it's happened. I would have posted this earlier, but I was busy writing a note on the deal for clients. Needless to say, as a fan of market disruption, this is pretty damned exciting stuff. Europe's largest single-market digital pay TV player drops a bomb on the incumbent telco, which is also its primary co-marketing partner. Or should I say was? Clearly the market is reading this correctly. 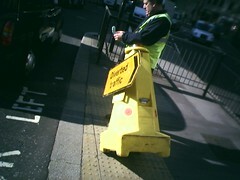 As I write BT is down 2.6%, Sky only 0.7%. What's more, the reaction to Sky's acquisition story (which usually elicits negative responses initially in any event) is complicated by reports that the EU is going to remove Sky's hegemony on Premiereship content on Monday. Whatever this may mean for Sky, the news for the incumbent players in the UK DSL market is less than good. Prior to this announcement, Easynet planned to unbundle 350 exchanges, taking it to within reach of around a quarter of homes in the UK. Under Sky's control, this will expand to over 1,000 exchanges, or 70% of UK homes, just below the coverage of Freeview. That's what I call making up for lost time. Back in February I produced a hideously long initiation of coverage note on Sky, in which I made the point that having the biggest, baddest, deepest, broadest TV offering imaginable was no longer enough, if it was only broadcast TV. Without broadband connectivity, it was highly unlikely that the company would achieve the growth targets it had publicly issued - that was my conclusion. Sky: But of course we completely disagree with your conclusion. I mean, of course we're aware of all the interesting things happening on the internet, but we don't believe any of it is capable of going up against what we've got. Me: Well, I did say quite clearly in the note that you guys have the best TV offering in the UK, hands down. My point is that, given technology and demographic change, people might not want so much TV, or at least not on its own. (I noted today that James Murdoch cited the large proportion of teenagers who publish blogs as an example of how things have changed.) And you guys look really exposed if I'm right. Maybe we should just agree to disagree on the philosophical stuff and focus on numbers and factual details. Sky: Okay, your numbers look fine. Your valuation, however, seems to be well below most of the market. (For the record my valuation was 549p, most brokers were well above 600p - Sky has since traded in a range between 510p and 590p. My recommendation was, and is, NEUTRAL.) What sort of terminal growth rate are you using in your DCF? Me: Yes, that's what I use for telcos. Sky: That may be fine for telcos, but we've got the best content anywhere, 24/7, on a platform with unlimited bandwidth. And we're still growing. Me: Will you be growing in 2016, when my forecasts terminate? Sky: Okay, your numbers look fine. Go ahead and publish, and please make sure I get a copy. But I should say that if we get questions on this, we're going to respond that we think that this internet angle is overblown. Me: That's fine. I'm certainly happy to defend my views. Anyway, it takes two to make a market. Eight months later, Sky spends GBP211m on a broadband connectivity play, and has a roadmap to address all the issues I highlighted. This company seems to have changed its DNA, and whatever this means for Sky itself, clearly other players should be scared. Personally speaking, I'm impressed. Over to you, Sky Italia. A Hammer of the Gods Club mega-value reader in Oslo writes in to say that he was paid a visit by door-to-door sales people from this company, trying to build up enough demand in the local area to justify a fiber roll. Pricing looks a bit steep (the 50/25Mbps package is EUR225, plus installation and activation), but is consistent with that of Lyse, who I am told are actually running the service. Yannick has a great post about the arrival of French-style pricing to the Spanish DSL market. Que lastima! A Gold Nugget mega-value reader points me to some numbers for any statistics obsessives out there. The OECD has just released its updated broadband statistics for H1 2005. Europe represents eight of the top ten most penetrated countries, with five of them Nordic. Most interesting to me is the growth in "other" technologies (i.e., excluding cable and DSL), up 13% in the past six months. In Korea, Sweden, Denmark and Japan, alternative technologies now account for more than 10% of all broadband access lines. A Palladium Club mega-value reader points out concerns that cable players are not moving fast enough in the nascent market for content portability in the US, and I think we could safely say the same for Europe. The NTL/Telewest newco has what looks to be a credible challenger to Sky+ in the pipeline, but the Sky+ HD box will have an Ethernet port, and Sky has long talked about the potential role of portable media devices in its services. Indeed, the company has already made some first steps in this direction with the Gnome - okay, it ain't pretty and it's not truly portable, but it attempts to extend the range of ways people use the platform, so it's an important indication of how they're thinking. I think it's safe to assume that something more impressive may be in the works for the HD launch next year. So, as it stands, I would expect Sky to emerge as the UK's "winner" in this area, if that's a meaningful word to use in this sector (winner defined as a company which manages to avoid going ex-growth in customer numbers). I once again have to stress that my gut feeling is that the development of the "folk PVR" will ultimately be more significant - here's the set-top box, middleware, user guide, EPG, portable media player. More interesting, in my view, will be the way the company manages the transition to broadband ISP (if in fact this comes to pass), and what services evolve out of such a move. Easynet's retail arm had only 21k customers at the end of August, so it doesn't bring much in terms of critical mass, though its wholesale business boasts OneTel as a customer. Precisely what Sky would do as a provider of wholesale connectivity is still something of a mystery to me, but I suppose it opens up a lot of preferred content deals with wholesale customers like OneTel (perhaps akin to the Sky by wire from HomeChoice), while it works on developing its own retail customer base. Certainly £1bn is a big warchest, and my personal speculation is still that the acquisition trail will next lead to Pipex. Pipex, number five in the DSL market following yesterday's acquisition of Freedom 2 Surf, is only looking to unbundle 60 exchanges currently, versus 350 on the drawing board for Easynet, so capex should be more efficient if the two programs were combined. More significantly, as I've stressed about Pipex many times previously, the wireless wild card makes it all the more interesting, potentially allowing Sky to evolve into a multi-technology (DTH, DSL, portable/mobile) delivery platform for more than just "native" Sky content - plus voice. Longstanding readers of this humble bloglet will recall that one aspect of industry disruption I have addressed from time to time is that of my own industry. Namely, the fact that a loosely federated open source research and opinion-shaping network seems to be taking shape - one which largely excludes the brokers. The well-informed fund manager, armed with an RSS newsreader and a list of highly recommended feeds, can do a helluva lot for himself, thank you very much. Take a heaping tablespoon of Telepocalypse, add two pinches of Richard Stastny, a smidgen of Tom Evslin, stir in healthy portions of the Ominator and Telcotrash, season (to taste), add water, stir, and presto. More adventurous palettes may like to sprinkle in some P2P, gaming, or a tasty melange of art and technology. I have, for a long time, had deep forebodings about the long-term implications of this for the brokers' research efforts. When your client base is sufficiently well-armed to say "Duh!" to your output on a daily basis, you have a problem. I have made my own efforts to reconcile the tension between writing "straight" research and the need to do something different, and it has had a profoundly positive effect on my access to information and created an entirely new network of valued industry contacts. This, in turn, has enriched the "straight" research. Together, they are larger than the sum of the parts. However, I have never been naive about the brokers' longer term ability/willingness to also harness some of the same approach for their own ends. There will remain the usual tensions between compliance issues, corporate politeness and proprietary vs. open information/discussion, which may ultimately undermine the effort. Nevertheless, it's still early days and the momentum seems to be building. Recently some Platinum Club mega-value readers have alerted me to two examples, one personal blog from Tim Poulus of Rabobank, and a more recent and highly intriguing bank-authorized blog from Rod Hall (also an American ex-pat VoIP quasi-obsessive) of DRKW in London. He kindly cites me as an inspiration, which is both gratifying and also unexpected in an industry where we typically try to publicly blank our competition. This is a fascinating time to be alive. KPN has just announced the launch of the Ay Yildiz brand (which means "Crescent and Star" - shame the website doesn't seem to work at present, probably because the launch is Monday) targeting the 2.6m-strong Turkish community in Germany on its own E-Plus network. KPN's Belgian subsidiary has had this brand in place in Belgium for two years, and it's quizzical that they didn't try this idea before now - after all Germany has the largest Turkish population outside Turkey. This sort of ethnic affinity branding has been common in the calling card market for a long time, and I have seen one or two examples in the access-independent VoIP space, so it's nice to see the cellular world actively pursuing some more granular market segmentation. Endless variations of this approach should now spring up across Europe (please ping me if you have other examples), and I can already see a huge number of no-brainers for ethnic affinity brands in what is now an untapped market. To start with, let me say that this is the title of a David Bowie song, rather than an entirely serious sentiment. However, as an American resident in Europe, I sometimes find myself asked by baffled Europeans to explain some of the actions of my countrymen. Notwithstanding the fact that it often makes easy fodder for some very high quality satire, I have to confess that sometimes I'm left speechless. Here are two more examples to add to the sucker pile. 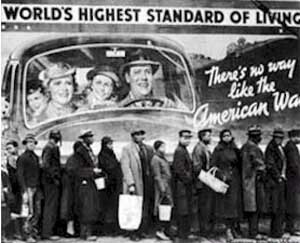 I seem to recall from history that previous attempts to seize control of and micromanage aspects of other countries' economies and internal politics (such as the classic early 20th century case when a group of American investors successfully had the Nicaraguan railways legally declared part of the state of Maine) can have unforeseen and negative implications. I'm not sure I completely agree with Jeff's assertion that the rest of the world necessarily looks to the FCC as a guiding light (indeed, in broadband access regulation, Europe and the US are headed in opposite directions), however, given how politically sensitive the issue of "Motherland/Fatherland/homeland security" has become, I can imagine few countries would be eager to be perceived as uncooperative. No one wants to find themselves creeping into the "axis of evil." But I'm being somewhat flippant here. My genuine long-term concern is that through the measures afoot in the US (and in Europe if it marches in lockstep), there is a significant risk that compliance and legal costs distract from innovation, exclude capital constrained newcomers, and drive fragmentation in the fabric of the internet. Cellular carriers (and their customers) continue to suffer 15 years on from the barriers created by the development of radio standards which were highly politicized and nationalistic exercises. I believe the internet is far too important to our collective future to risk this, and if allowed to take root, I believe the macroeconomic impacts on the instigators will be negative. All that said, I'm not terribly certain what most of us can do about it. Some very bright and eloquent people will shout, lawsuits will be filed, lawyers will buy new Ferraris, the smart money will lobby (operative word = "money"), investors and innovators will be discouraged and look elsewhere. Somewhere else in the world, people will be getting on with developing some amazing things, and the risk for the US is that the next Skype/BitTorrent/Firefox comes out of Russia, India or Brazil, and that's where the capital will flow. I noticed a lot of cheering and envious statements from the US when openreach (notice how the lack of capital letters in the name is intended to suggest a level playing field) was launched. Well, the UK Telecoms Adjudicator's unbundling update for September is hot off the presses, and it looks like the only way is up. The previous release stated that at the end of August there were 105k unbundled lines, growing at 4,000 per week. Based on today's release the total is 123.2k lines, showing that there has been no appreciable acceleration. It would be tempting to dismiss this as demand-related, but the other KPI of note is that the number of launch dates missed or in jeopardy (yellow) is at an all time high, while projects on track (green) are at an all-time low. The Adjudicator says he has "significant cause for concern." At only around 9.3m downloads to date, Gaim can hardly claim global dominance in the face of MSN/Yahoo! 's community of 275m, but that's hardly the point. Gaim is the glue which is capable of binding all these disparate communities together (with the notable exception of Skype) without the need for press releases and public shows of mutual respect. Brokers beware, the power of decentralized, distributed information is on your tail like a hellhound on steroids. The Godfather of Broadband, Om Malik, has launched a global wiki devoted to the subject, and I am contributing here and there, along with a growing number of people with local knowledge and insight. If the contributor base can maintain its enthusiasm and commitment, then this will be the first site (as far as I know) which will aggregate broadband market information on a near real-time basis globally. We like it! The Malone cable machine announces something nearly every day now, it seems. This morning, hot on the heels of the Cablecom acquisition, we learned that Liberty Global would be raising its stake in Telenet to 20%, and there were reports out of Scandinavia that UPC Norway and Sweden are on the block. Then a strange thing happened: I got word that UPC Netherlands apparently released a press release today (at this point not on their site) in which it walked away from its previously stated digital migration strategy - namely to migrate its entire 2.3m subscriber base to digital services by the end of 2006. Previous reports out of the Dutch media indicated that this would result in all UPC subs paying an extra EUR3 per month for digital services, for a total of around EUR18.53 per month. I am now told that the company aims to migrate only those who want digital, charging EUR17.99, and is now expecting only 1m digital converts over the next two years. So, they've dropped pricing, presumably cut way back on the subsidy for decoders and lowered their target for migration drastically, and I'm wondering what's happening here. Is this related to the recent capital outlays in Japan, Belgium and Switzerland, or is it simply in response to the groundswell of negative press coverage and political attention which the company has received (as documented here on countless occasions)? As of yesterday, the RSS feed is active again. Just for the record. A Triple Platinum mega-value reader calls my attention to an interesting article in The Guardian today about the potential use of proceeds from BSkyB's impending GBP1bn bond issue. I started off the year by writing a very long report on Sky which focused centrally on the lack of a broadband return path and inherent inability to provide on-demand content. Clearly unbundling is the way to go in the current market, and I generally agree with the takeover candidates mentioned in the article (two of which are in my long-running list of inevitable M&A targets). I'm not so sure about the likelihood of HomeChoice being on the short list. HomeChoice has a great product, to be sure, but there would undoubtedly be duplication of effort in areas as basic as the set-top box, EPG, and content (Sky content is already available via HomeChoice in any event). If an interactive pipe is what they're after, then I think Pipex is probably the best bet at this point. Intriguingly, it also has a nationwide WiMAX license, which may also hold some appeal longer term (recall Chase Carey of sister company DirecTV's statements on broadband wireless back in the Q2 results). This would also give Sky an expanded mobile presence in future iterations of the technology. Pipex is up 12% so far this month, but still only has a market cap of GBP200m, so a bond issue of the size being discussed would easily cover it and the cost of accelerated unbundling (GBP100 - 200m according to the article). This makes me wonder what Premiere may be thinking in the German market. I've noticed a helluva lot of i-mode marketing in the outdoor arena over the past week. 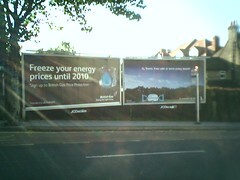 This billboard is in the center of the gigantic Elephant & Castle roundabout in South London. I've spent time in various of the other European markets where i-mode has been rolled out previously, but I've never seen anything like this. A Palladium Club mega-value reader writes in with an interesting scenario. Google revives Google Voice, links it with Google Talk, and integrates the mapping/local search elements to serve up highly location-specific sponsored search results. Add wireless connectivity, and we have a free (to the end user), advertising-supported mobile audio search service, probably a superior formula to other attempts on the radar. A Platinum Circle mega-value reader astutely notes that the new Bang & Olufsen/Samsung phone, while perhaps overstylized, has one interesting feature: it integrates with the home DECT phone's address book via a docking cradle (as long it's also an extraordinarily expensive B&O model). I'd be willing to bet that future iterations integrate more closely (and that B&O won't be the only ones to do this), and if the hybrid GSM/DECT base station is plugged into an ATA, you basically have a BT Fusion-like proposition, but perhaps from players who aren't even involved in access at all. UPDATE: This article seems to suggest there's a GSM/DECT fusion product coming in 2006. Well, it's one week later and still no revival of the RSS feed for Skype statistics. Hmmm... Also, a registered user of www.ebay.co.uk reports that there is a discreet Skype promo ad (thanks for the screen grab) on the home page (just next to the "Top Tips, Tools and More" section). I am not a registered user, and I can't see the ad. So the campaign to win hearts and minds in the eBay community has begun, and I guess perhaps it also suggests that the transaction has closed. One rationale given by eBay management for the Skype acquisition was that Skype's penetration in certain markets was greater than eBay had been able to achieve, thus Skype could be used as a cross-marketing tool for expanding eBay's footprint. Japan was given as a key example. Well, the cross-sell just got a bit harder, as DoCoMo has announced a JV with homegrown auction site Rakuten. DoCoMo's subscriber base in Japan is nearly as large as that of Skype itself, and it has its own highly successful payment system in place, which has the added advantage of being useful for far more than online transactions. I don't know how many more of these single market responses to eBay/Skype we can expect, but on the surface this one has a number of strengths which definitely make it worthy of attention. A Nordic mega-value reader alerts me to some Telio coverage in the online financial press in Norway: "Filthy rich from IP telephony." Apparently the three founding partners had individual stakes worth NOK57m at the time of publication, and the company's current stock market valuation was NOK394m ($63m, or about $1000 per sub). Friday night I got a press release from Level(3) which still hasn't appeared on the corporate site. Predictably it had to do with the Cogent depeering situation. This made me think about implications for the Google/Cogent relationship in the Secure Access product. Every trace route I have done has shown me reaching Cogent via Level(3). Maybe Google and Level(3) move closer? Dean Bubley of Disruptive Analysis has started his own blog on wireless issues. As an industry analyst/consultant, I strongly suspect he speaks to different people within companies than the conventional broker analyst, and even in his first few posts he's got a couple of interesting tidbits I can't imagine seeing in a can of broker spam. I had a meeting with a client recently who was concerned about some holdings in the directories space. With Google, et al seemingly poised to take over the world, was there any future for these businesses? I pointed out that the vast majority of the really impressive stuff Google and others have accomplished in local search has been limited to a handful of markets, most of them English-speaking (with the odd exception). Even in core Europe, the range of locally optimized features is still relatively limited. So there's an awful lot of work to be done in this area, and boring old directories businesses could play a major role in accelerating this, in my view. Yell, for example, provides the business listings for Google Local in the UK, but probably more importantly, it has longstanding relationships with thousands and thousands of businesses which have no web presence yet. These might be the kinds of businesses which might fit nicely in an eBay "local services market" concept (plumbers, carpenters, electricians, house cleaners), as Martin Geddes suggested to me a couple of weeks back. There may be potentially huge, untapped transactional value lying within the pages of the humble directory, and at the moment a lot of it is controlled by companies which telcos spun off opportunistically during a time of financial need. Interesting that these names have outperformed not only their own sector (media), but moreover, the STOXX Telecom index by 8 - 24% since the beginning of the year. I wouldn't be at all surprised if some of them end up getting snapped up. As readers of this humble bloglet will by now be aware, one of my pastimes is tracking Skype traffic using the RSS statistics feed published by the company. So you can imagine my consternation at the fact that the feed hasn't updated since Tuesday evening. I also notice that the spiffy charts in the Share Skype site also don't appear to be linked anymore (well, not in my browser on Friday morning). I am trying to keep the conspiracy theorist inside me at bay. Maybe someone's on holiday, on a course, or maybe they're just otherwise engaged, but I'm a bit concerned that maybe this is the first step in a gradual move toward less openness. Hope I'm wrong. Update: No sooner had I posted than I saw that Stuart, eagle-eyed as always, has noticed some other changes worthy of consideration. Maybe this is a first step towards corporate blandness. Visions of the cable future? "Under the agreement, IPMobile will increase its capital to about 1.32 billion yen in October by issuing new shares to Liberty Global, CSK and others. If the ministry decides to issue IPMobile a license at year-end, then Liberty Global will offer additional financing of more than 20 billion yen, while the rest will come up with a combined sum of at least 30 billion yen. Operationally, Jupiter Telecommunications Co. (4817) -- a leading cable television programming provider in which Liberty Global has a stake -- and Rakuten will offer content for the cell phone service." Liberty's gigantic European cable unit UPC is already moving into the MVNO space, and as far as I know UPC is still in possession of some spectrum in various European countries from the wireless broadband 1.0 era. All this makes me wonder what's in store for Europe. Not to be outdone by the Danes, the Norwegian regulator has also issued a mid-year market update, showing that 14% of broadband connections have broadband telephony subscriptions. That's 110k in all (the total has nearly doubled since the beginning of the year), of which 107k are residential users, and we know who has the largest share of this market (slide 12 has a precise breakdown). Also of interest is slide 10, showing pretty strong growth in broadband connections using "other technologies." This seems to suggest that Lyse's FTTH moves are gaining traction, and I am hearing that the company is going to become more aggressive in this area. Across the pond Covad has made a move on NextWeb to speed access to customers and cut the cost of gaining that access in the first place. Clearly this is a product of the rather unfortunate recent direction of regulation in the States (and $19m is a lot of Covad paper), but it makes me wonder about FWA as a catalyst for M&A in Europe. T-Mobile continues to work on its proto-WiMAX train project in the UK, and given what DT is doing in the French and Spanish DSL markets, I have a hard time accepting that Pipex wouldn't be of interest. A Platinum Circle mega-value reader alerts me to updated stats from the Danish regulator for the first half of 2005. Looks to me like commercial (i.e., non-Skype/other IM-related) VoIP user numbers equate to just over 3.1% of total phone lines, or 7% of broadband lines. For serious VoIP watchers, there is a subscriber breakdown by service provider included. Just received this update from Motorola. It's much subtler than the Verso press releases, but Verso needs to make more noise (check out the 1-for-5 reverse share split announcement). Anyway, I think the underlying message might be the same, linked, as it is, to "providing the ideal architecture for operators to realize new, revenue-generating services while ensuring their subscribers’Quality of Experience (QoE)." I hope what is also being protected is my right to choose applications without interference from my access provider, but I suspect I might be overly optimistic here. 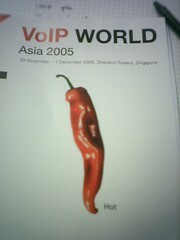 Startling new prediction: VoIP industry conferences to outnumber VoIP users globally by 2007!!!! I get a lot of marketing spam from conference organizers, and from it I calculate that if I had an unlimited travel budget and inexhaustible goodwill with management, I could spend upwards of 50 days a year out of the office going to VoIP events alone.